Ross started a construction company to build modular homes for low-income renters. Unfortunately, the four units he helped build were never occupied due to contaminated soil. Undaunted, Ross later became the director of the United Inner City Development Foundation (UICDF), an agency which assisted small businesses. He and Norward Brooks also started N.J. Brooks Construction Company. After leaving the UICDF, Ross accepted an appointment with the Federal Regional Office of Energy and later worked for the Seattle Vocational Institute (SVI) as a liaison between the minority community and the Seattle Public Schools. Ross suffered a heart attack and died on August 21, 2007. He was 66. 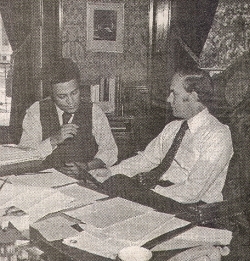 Charles E. Brown, “Civil-Rights Leader Was Never Afraid to Buck the Tide: Michael Ross Served as Legislator, Worked for Job-Opportunities,” The Seattle Times, 26 August 2007, B. 7; “Community Mourns the Loss of Michael K. Ross—Washington State’s Last Black Republican Legislator,” The Medium, August 2007.